Yes, indeed, it has been too long that I have not been here or anywhere else, life just gets crazy sometimes. So I am back and hopefully will stay and get some cards posted. This month at Through the Purple Haze is for Halloween of course and scary too! So lets get going here. This image is from East Wind and is the Halloween With with Black Kitty. The Black Mesh, Spider, Boo Clothespin, Bats were all from stash too! And the above card was the final outcome. 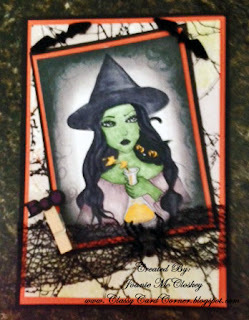 So it's time for my scrappy friends to get into their stash and get your card posted in the Challenge at Through the Purple Haze "Halloween". I have to share this.... scary but funny! As I am here typing my blog this awful clacking sound starts and I am looking everywhere, I had no idea what it was or where it was coming from and my daughter in the other side of the house comes in the scraproom and is asking what is that noise... as you walked around the room the noise sounded like it was coming from the other side. I said, oh, it's coming from the laundry room, nothing there either. Finally, she looked up and there was a balloon she received for her birthday hooked in the fan and it was just making that awful noise with the ceiling. It really was scary and was very loud. Well, my friends, I am glad you stopped by and I hope to see you again real soon. Hey girls. Miss you and love this card! Thanks. We miss you too! Hugs!